Rooms & Suites	The pleasure of choosing: Room (35 m2), Junior Suite (55 m2) Suite (66 m2) Presidential Suite (120 m2). 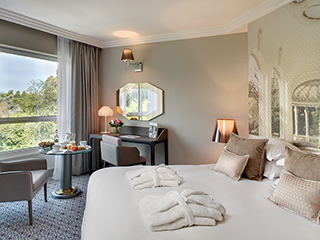 The elegant and extremely comfortable guest rooms and suites (5 star hotel in France) with terraces* overlook the peaceful and magical setting of the Parc Napoleon III and the Allier lake or the Vichy Thermal Spa Les Célestins. With 35m2 for a Deluxe Room, 55m2 for a Junior Suite, 66m2 for a Suite and even 120m2 for the Presidential Suite, the size of the rooms is largely superior to the European average for hotels of the same category. With its constant initiative to upgrade, the Compagnie de Vichy pursues its room renovation programme and for this the "Mistress of the House" works in close collaboration with architects throughout the year. Inspired by the history of the Domaine Thermal de Vichy, the interior decoration is intentionally minimalist,conducive to well-being and serenity while expressing elegance, unpretentious luxury and discreet modernity. The octagonal shape of the Vichy Pastille is subtly reproduced in the line of the armchairs, tables, desks and mirrors… The materials and colours of natural hues, wood, grey and raw silk combine with graphic and colourful images above the beds, evocative of romantic strolls in Vichy that recount the history of the Domaine Thermal; large, serene photos adorn the Park galleries, the music kiosks and Hall des Sources. Each photo is different but always reproduces the same soft Autumnal or Spring tones. In the guest rooms and suites (5 star hotel in France), you will find several discreet references to the Thermal resort: new carpets, graphically inspired by the glass pearls of the Hall des Source, mirror the motifs on the head boards. The copper bedside lamps by Philippe Starck and the white luminaries by Patricia Urquiola recall the octagonal shapes of the Vichy Pastille, producing Chinese shadows on the greenhued walls. The fine wood furniture is designed by architects and manufactured in France. Extremely comfortable king-size beds and an authentic and serene atmosphere guarantee moments of perfect rest and relaxation.